Now that the Common Ground Fair is behind us, we can shift our focus away from displaying apples to supplying apples! 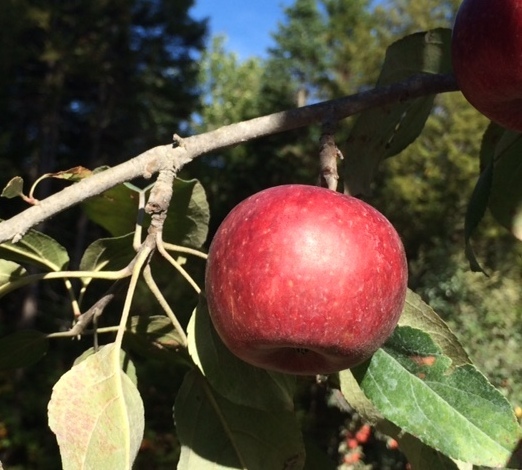 With Great Maine Apple Day two weeks away, we have at least a few days to enjoy all the apples we can. In addition to picking all the varieties that are ripening at this point in the season, we've been busy harvesting all of our frost-sensitive fruit & vegetable crops and curing/preserving/storing them for future consumption. It's that time of year when being in the gardens is bittersweet: the shorter and colder days are often dispiriting, while the brilliant fall colors and all the ripening fruits are uplifting. As the saying goes, the sweet is never as sweet without the sour. We're delighted this week to be sharing with you some of our favorite culinary and fresh-eating varieties. We hope you like them as much as we do, and that you embrace the season for its beautiful bounty! Your share this week is a mixture of five very old varieties and one relative newcomer. Fameuse, Gravenstein, Jonathan, Wagener, and Twenty Ounce were all popular apples in New England orchards by the early part of the 1800’s. Mainers loved them then for pies and sauce, and we think you will enjoy them 200 years later. They are also good for fresh eating, especially Jonathan and Fameuse; although you’d have to be mighty hungry to tackle a Twenty Ounce by yourself. The new kid on the block is Frostbite. John rescued this tree from experimental station obscurity after we tasted it and were knocked out by its unusual flavor. You may like it or hate it, but once you try it, you won’t forget it. Besides its distinctive flavor, Frostbite is an excellent breeding apple. It is the parent of two apples that we hope to offer later this fall, Sweet 16 and Keepsake, as well as two offspring that were bred here at Super Chilly Farm – the diminutive Pipsqueak and the much larger 447-3 (name pending). We are very enthusiastic about these new, home-grown varieties that are just starting to produce in our orchard. Who knows, maybe they will be the next Honeycrisp? And we just want to say a word about some of the apples we are sending you this week. You may notice that the Fameuse is not as blemish-free as most of the apples that you have been receiving. Fameuse is a variety that, like McIntosh, is very susceptible to a fungal disease called scab. It is difficult to prevent scab with organic orcharding methods so we don’t even try. Our solution is to avoid growing varieties that get scab. However, our Fameuse tree was a resident of our farm long before we were, and we love its size, shape and apples. We tolerate the scab because it is only cosmetic and doesn’t affect the taste of the fruit. In fact scabby apples are said to be higher in antioxidants. If you don’t like the looks of the Fameuse in your bag, get out your peeler and discover the pure, white flesh underneath. You’ll see why we kept the tree. You may also be wondering about the gray, powdery coating on some of the Frostbites. Although it has finally gotten colder the past week, that is not frost. That is Surround, a Kaolin clay spray that we use to repel insects that attack the apples in the spring. Kaolin clay is a naturally occurring mineral that is approved for organic orchards. We apply it 3-4 times right after the petals fall from the blossoms, so we are surprised that it still shows up on some of the darker apples several months later. It is not harmful to humans (or insects – it just gets in their eyes and ears); it is even used as a food additive. However, we recommend washing all your apples before eating them. Polish up those Frostbites, and they will be hard to resist. Thanks to everyone who stopped by the Fedco Trees booth to say hello, submit an apple for identification, marvel at the stunning-as-usual displays, or clamor for their favorites during the apple tastings. John still has many speaking engagements scheduled for this fall. Visit our calendar to see if he's giving a talk near you. 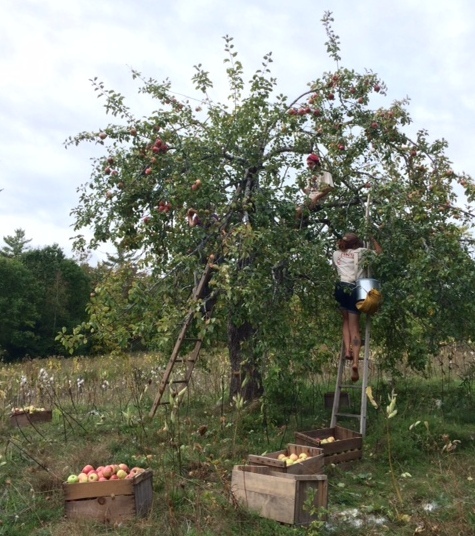 If you missed out on the fair, be sure not to miss this year's Great Maine Apple Day! The event is scheduled for Sunday, October 18th from 12 to 4 (rain or shine) at the Common Ground Education Center in Unity. Admission is $4, $2 for MOFGA members, and kids are free. Tour the MOFGA orchards, learn about making cyser (apple mead), and sample dozens of apple varieties, many of which aren't featured in our CSA. The Out on a Limb crew will be there with apples and t-shirts for sale. Come say hello! On May 11, 2015, Francis Wendell Fenton passed away in the same room in which he was born on the Sandy River Road in Mercer, Maine. He was two months shy of a hundred. He was more than likely America’s oldest orchardist. He was out spraying his trees just a couple of days before he died. 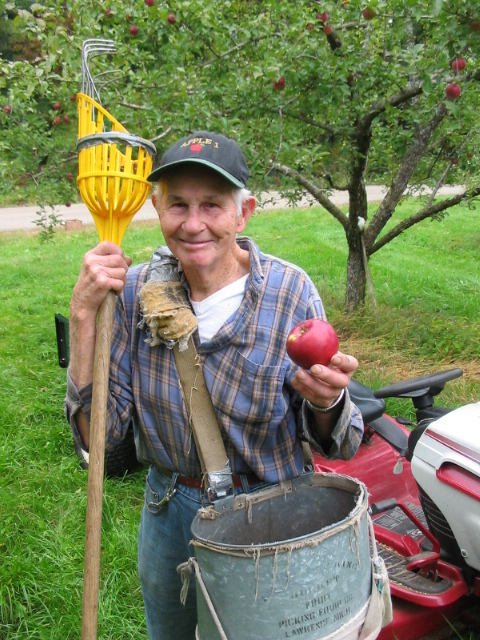 Not only was he Maine’s senior orchardist, he also had one of Maine’s largest apple collections, many of them found and grafted by Francis himself over the years. He was a man with a great deal of knowledge, an infectious love of life, a wonderful sense of humor, tremendous generosity and a passion for apples and people. He attributed his longevity to his daily lunch of hot applesauce and ice cream. My first memory of Francis was from one of the early Common Ground Fairs in Windsor. He was standing beside an apple display he had created by stabbing twenty heirloom apples onto nails protruding from a large upright sheet of plywood. He stood and talked to fairgoers all day. Francis loved to talk. He loved to teach. He reminded me one of those old time hawkers at a sideshow. When he stopped coming to the fair, I decided it was time to take up the torch and create a Fedco apple display. That was when I tracked him down in Mercer and our friendship began. For the next 20 years I visited his Sandy River Orchard many times. I collected apples to display and scionwood to graft. He and I walked the orchard together over and over and over again. When he was no longer confident of his own grafting ability, I grafted for him. Francis’ father planted the orchard in 1906. Of the original trees, about 40 remain. These include a Mac, a Pewaukee, a Ben Davis, and about thirty Wealthys. Francis left for San Diego and the Pacific Ocean when he was twenty two. After the war he stayed in California but regularly returned to Mercer and in 1972 he moved back home for good. The orchard had grown up to white pine and the old farm house had all but collapsed. He renovated the house and the barns and rescued as many of the old trees as he could. He then filled in the gaps with young whips, many of which he grafted using scionwood from the ancient trees on surrounding farms. For a number of years he would appear at the Fedco spring Tree Sale. We would give him a name tag and make him a honorary employee for the day. He would stand and hold court and sell trees. Customers loved him. He never stopped planting trees himself either. One year, when he was about 95, he was standing in line holding a tree he intended to purchase. As I walked by, I heard him say to the stranger next to him, “I always wanted a Red Astrichan.” By the time he was 99 he had 400 apple trees of over forty varieties along with an assortment of pears, plums and other fruits. Francis’ favorite apple was Wealthy. He always said it was the best there was. A long term plan for Sandy River Orchard is being developed by his close relatives. It will remain in the family and continue to operate. It is currently being managed by two young orchardists, Abbey Verrier and Angus Deighan. Abbey was an apprentice on Super Chilly Farm for several years and Angus has become a fixture here as well. Besides transitioning Sandy River Orchard to organic and picking gazillions of apples, they have started their own cider business called Rocky Ground. We are pleased to be offering a number of their varieties this year in our CSA. We’re also looking forward to sampling many of their ciders soon! Angus pointing out a still-visible graft union on an old tree. One of the downsides of deciding to eliminate meat from my diet when I was 15, long before I learned to like caramelized onions, is that I have never experienced the steamy, savory pleasure of a bowl of French onion soup. I can readily conjure up the image of a crockery bowl encrusted with dripping cheese and slopped soup, served in a pine-paneled barroom on a rainy fall Saturday lunch to diners dressed in thick wool sweaters. But alas, my spoon has never broken through that cheesy crust because I have never met a bowl of onion soup that wasn’t made with beef broth. That is until I read this recipe in the NY times. Although Florence Fabricant didn’t dare include the word “French” in the name of her soup, this onion soup, which is made with vegetable stock and hard cider, makes us say “ooolala”. Even better – it has apples in it. The original recipe is reprinted below, but I prefer it with slightly fewer onions and 1-2 more apples. If you are wondering what to do with the remaining ½ bottle of hard cider, it makes a nice accompaniment to the soup. Bon appetit. Total time: 1 hour 15 minutes. Serves 6-8. Melt butter in a 5- to 6-quart saucepan on very low heat. Add onions and garlic, dust with salt, stir in apples, cover and cook until onions are very soft, about 30 minutes. Stir in sugar, increase heat to high and cook, stirring frequently, about 15 minutes, until onions start to brown. Stir in cider vinegar, scraping bottom of pan. Reduce heat to medium-low. Stir in cider, soy sauce and stock, bring to a simmer, cover and cook gently about 20 minutes. Season with pepper and, if needed, more salt. Heat broiler. Pile the cheese on the toast slices, covering the bread completely. Divide soup among 6 to 8 ovenproof ramekins, deep bowls or big mugs with about 12-ounce capacity. Place a slice of toast and cheese on each, place ramekins on a baking sheet and broil just until cheese melts and starts to bubble. Serve at once. Every year at the Common Ground Fair, I am tempted by booth after booth of amazing (and ridiculously indulgent) food options. This year two friends and I decided to split a huge Bloomin' Onion and basked in its deliciously greasy glow as we slowly wandered the fairgrounds and took in all of the sights. Not long after, I was chatting with another friend when she described a Bloomin' Apple recipe she had recently tried. My ears immediately perked up. It sounded like a perfect use for this week's massive Twenty Ounce apples, and having just tried it out, I can tell you they rose to the occasion quite nicely. (Thanks, Marfie!) Read the original post at 'The Gunny Sack' for helpful step-by-step photographs. Freshly baked and ready for eating!